Chillers represent a substantial investment in institutional and commercial facilities. A heat transfer device that uses a refrigeration system to remove heat from a process load and transfers the heat to the environment, it may be seen as a cooling machine to condition various facilities. Chillers lower the temperatures of all kinds of equipment and processes, such as robotic machinery, semiconductors, injection and blow molding machines, welding equipment, die-casting and machine tooling, paper and cement processing, power supplies, power generation stations, compressed air and gas cooling systems, medical imaging machines, chemical, drug, food and beverage production, and even simply to cool potable water to desirable levels. Whether for office comfort, keeping data server centers from overheating, or specialized industrial processes, water temperature control plays a vital role in many of the behind-the-scenes activities affecting everyday lives. The HVAC chillers market has been growing, despite competition from other cooling technologies. The global market size of chillers is estimated at USD 9.15 billion in 2017, poised to reach USD 11.33 billion by 2022, at a CAGR of 4.4 percent. District cooling is replacing the traditional air-cooling methods because of increased advantages like energy-saving, low environmental damage, and reduced maintenance needs. The increasing tourism in emerging nations is pushing for more construction of hotels and public infrastructure, which make extensive use of district cooling. Another current market driver for HVAC chillers is the growing number of data centers. One of the major challenges is environmental regulations and guidelines. Keeping emissions low is a continuous struggle. The HVAC chillers market will transform how projects are done in the future. Asia-Pacific is expected to hold over 50 percent market share by 2024. The region accounts for over 60 percent of the world population. MEA is expected to witness a noteworthy increase in demand. Chillers may primarily be classified as absorption chillers and refrigerant compression chillers, based on the refrigerant cycle on which they work. Absorption chillers use a heat source such as natural gas or steam to create a refrigeration or cooling effect, whereas refrigerant chillers use mechanical compression. Air and water are the two main refrigerant compression chillers. Air condensers are cooled by utilizing air, whereas water condensers are cooled by using water sources. The compressors may be reciprocating, centrifugal, rotary screw, and rotary scroll type. In 2017, screw chillers as a product segment dominated the global HVAC chillers market and accounted for a market share of over 35 percent. With progress in the efficiency of air-cooled chillers over the past 5 years, the air-cooled market is anticipated to grow at a faster rate and supplant some of the water-cooled part of the chillers market. The market is also seeing strong growth in modular chillers, particularly for heat recovery, heat pump designs, and chillers that are multi-purposed for both heating and cooling. Absorption chillers are one of the fastest-growing types of chillers. The global market size for centrifugal chillers is estimated to exceed USD 1 billion by 2024. Chillers, much like the rest of the HVAC world, have seen the need to increase operational efficiency. Manufacturers have made some dramatic inroads as an industry into the overall annual efficiency of chillers with variable speed drives and volume ratio technology, and different types of condenser fans. A close eye is being kept on what is happening with refrigerants too. An important feature of chiller products is their capability to store thermal energy during off-peak hours by having a dual mode – day mode, which is for cooling operation and night mode for ice generation during off-peak hours at night. Also, when it comes to low-GWP refrigerants chiller product developments, they are globally legislation-driven considering the EU F-gas regulation and the Kigali Amendment to the Montreal protocol. 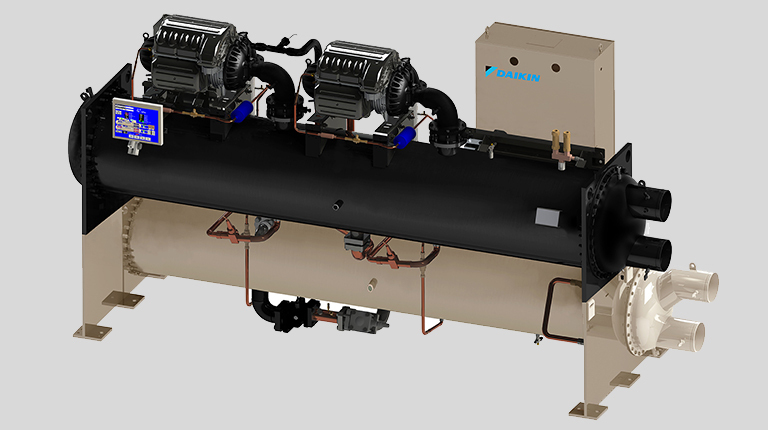 Most common developments in air-cooled chillers are with R1234ze that has very low GWP, A2L safety classification, and compatibility with most existing compressors and heat exchangers, which makes it a preferred solution for air-cooled chillers. Other options include HFO/HFC blends like R513A, available in selected markets. Growing concerns over the lack of non-flammable, low-GWP alternative refrigerants for R-410A for VRF systems has created opportunities for smaller chilled water systems. The trend toward zero energy for all buildings is driving chiller designs to do more than just provide chilled water; they need to be able to achieve the energy efficiency, redundancy, and flexibility required by today’s high-performance mechanical systems. As a chiller is the heart and the biggest energy consumption unit of the entire HVAC system, customers are diligently checking all the aspects of procurement and analyzing the total cost of ownership for 10 years. The lifetime cost of an air-cooled chiller is approximately equal to 20 times its initial cost. To select the right solution for a specific requirement, a manufacturer evaluates many parameters; major being CoP, NPLV, energy efficiency, footprint, noise, and corrosive resistance. Focus continues to be on innovation and technology, besides competitive pricing strategies. Expansion of service networks to support market presence and offer a high degree of after-market services is a guzzler. Chiller manufacturers are also looking into integrating renewable energy systems like thermal hybrid panels that harness solar energy, which in turn adds pressure and heat in the refrigeration cycle, displacing a portion of mechanical energy by keeping the compressor in the low stage. As the market continues to grow and advance, owners will continue to build new facilities, targeting net-zero energy and incorporating a variety of construction components and renewable energy, like solar photovoltaic panels and high-performance mechanical systems. Owners are planning long term to counteract the effects of steadily rising energy costs and to become energy independent. Redundancy will continue to grow as everyone wants to avoid downtime, not just in critical facilities, but also in buildings that feel economic effects. The market will start to see a shift in refrigerants over the next 5 years. Growth of chiller equipment using alternative refrigerants will take place slowly over time, as equipment and component manufacturers optimize new designs for new fluids. If the costs for new refrigerants were to drop, then the growth of alternative refrigerants could accelerate. Daikin has emerged as one of the most active players in the chillers market. In 2009, Daikin India commenced production of chillers at its manufacturing unit at Neemrana, Rajasthan. Besides the manufacturing capacity of 1.5 million room ACs, 50,000 VRV units, 100,000 cassette units, and 20,000 ductable units, the Neemrana unit has a production capacity of 1000 chillers. Last fiscal, the company garnered a market share of over 20 percent in the segment and kept up the assurance of a higher growth rate than the industry. With a comprehensive range of chillers, the company is poised to power up various mechanical cooling process applications across different industries. They are an ideal choice for commercial, industrial, and institutional HVAC applications. Daikin chillers are a testament to the company’s unmatched engineering capability.